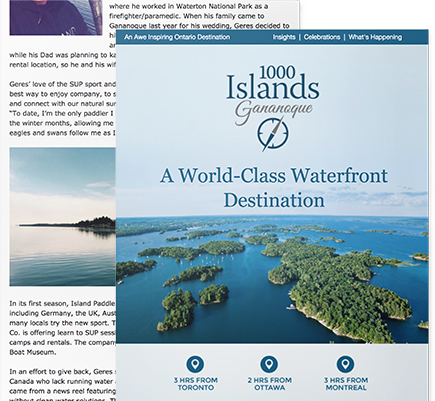 Gananoque and the 1000 Islands is a boater’s paradise, fisherman’s playground, hiker’s haven and a cyclist’s waterfront adventure and it’s easy to see why it’s regarded as one of the most beautiful places on earth. Amid the spectacular scenery of lush woodlands, rock and cobalt-blue water, the 1,864 islands that make up the 1000 Islands truly lives up to its reputation as a world-class waterfront destination. Embrace the outdoors with freshwater fishing, cycling, golfing, kayaking, boating, hiking and summer events. Laugh a thousand times at Canada’s most beautiful theatre settings. Step back in time with a visit through self-guided walking tours and breathtaking cruises and take full advantage of the rugged Canadian Shield on a renowned golf course. Gananoque and the 1000 Islands is a haven for adventurers of all ages. Perched along the banks of the St. Lawrence River in Ontario, Canada, Gananoque (pronounced gan-a-nock-way) is considered the gateway to this wonderful destination. Only a few hours drive from Toronto, Ottawa, Montreal or northern New York, Gananoque’s small-town, friendly atmosphere and laid back pace is a welcoming place for those city-fleeting travellers. A corridor for outdoor enthusiasts, the 1000 Islands can be experienced and enjoyed from land and water alike. Cruise along the shimmering waters of the St. Lawrence River aboard one of the Gananoque Boat Line cruises: tour the romantically famous Boldt Castle, built in the 1900s by millionaire George C. Boldt for his wife who tragically died before its completion; journey along the area historically known as Millionaire’s Row to witness some of the lavish homes of the rich and famous; sail beneath the 1000 Islands International Bridge connecting Canada and the United States; learn the tales of the sunken shipwrecks lying in the St. Lawrence; or aboard an evening cruise and experience the magic of the 1000 Islands at night. The natural world of the 1000 Islands also awaits those seeking a more intimate experience. Get up close and personal exploring by kayak, canoe, scuba, bike or foot. 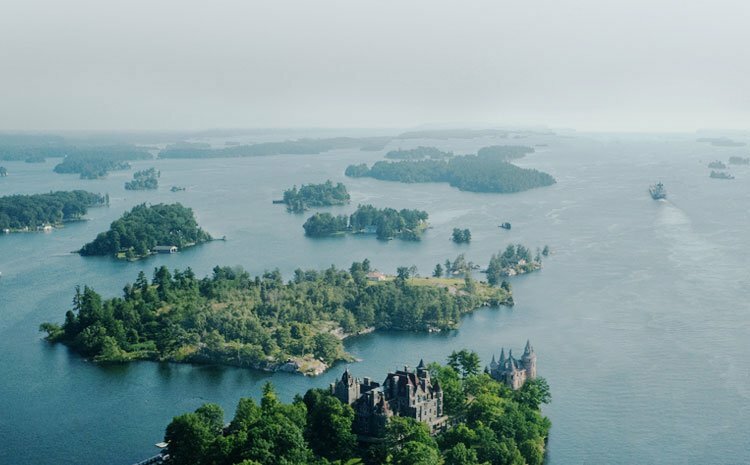 See the waterways and spectacular beauty mid-air aboard a helicopter tour or rise 400 feet above ground in the 1000 Islands Skydeck. Reflect on the history of Gananoque and the 1000 Islands and discover a place where past meets present by visiting the Arthur Child Heritage Museum. Engage in one of the area’s biggest amateur fishing events, the Big Bass Challenge – hosted annually in the heart of the 1000 Islands. Or enjoy the immaculate fairways and scenic views of the award-winning Smuggler’s Glen golf course. After a day of exploring, engage yourself in the entertainment and provocative storytelling at the Thousand Islands Playhouse. With two venues to choose from – Springer Theatre and Firehall Theatre – the theatre’s vibrant productions, exceptional performances and passion for storytelling announces their commitment to quality theatre. Eating in local restaurants is pleasing for all palates. Sip an evening cocktail or enjoy the culinary delights in one of Gananoque’s variety of restaurants, offering casual or intimate dining and fabulous menus composed of locally grown fresh produce. Why not gamble for fun at a small and popular local casino; OLG Casino is concealed on the outskirts of town and is fully accessible from the 401 Highway. Or take some time and experience any of the spa packages and accommodations offered by local inns, hotels and motels to suit any budget. Once a playground for the rich and famous, Gananoque and the 1000 Islands is a must-see waterfront destination for your weekend getaway. Be sure to make the 1000 Islands part of your summer travel plans.